Randall at Retro Role Playing recently had a post talking about his upcoming Lord & Wizards product, and how he's going to rectify ACKS's proficiencies with what he's wanting to accomplish. At this point, it would be remiss of me not to mention the Retro Role Playing Cancer Fund. Go there now, and do some good for a guy that's put a lot out into the OSR world, with Microlite74 and associated products. You'll get a download link for a lot of extra Microlite74 goodies, with some real good stuff in them. I'm super excited that he's basing L&W on ACKS, as it's my system of choice and I'm really looking forward to what he's going to come up with - Microlite74 is informing some of my decisions on boiling ACKS down for my kids. I'm also trying to rectify ACKS proficiencies with how my brain thinks, so it'll be nice to have a comparison point - I got into the OSR a little while back, found ACKS, fell in love with the backend economic systems, but I've flip-flopped a bunch on the proficiency system as-written. He got me to thinking about it again, and I decided to look into the 'skills' type of ACKS proficiency - where you gain a 50% chance to succeed on your trained task, with possibly the option of taking that proficiency two more times. ACKS has an "Adventuring" proficiency, given to all PC classes for free, which covers a lot of the basic maintenance skills an adventurer would need out in the field - the interesting text in that proficiency is - "He knows how to ... search for a secret door". Now there's something with a roll attached to it! Unless you're an elf or took another proficiency, you find secret doors on a roll of 18+. That number also happens to be the default number for Hear Noises and Find Traps (non thieves). Let's say 18+ is our general "Everyman" skill roll. That's a 15% chance by default. We also know that ACKS decrements the throw required by 4 every time you take a proficiency that can be taken multiple times - 11+, then 7+, then 3+. We can't get to 11+ from 18+ subtracting four each time - we go to 14+ and then are stuck - our next step is 10+. We need a three. Where's a +3 come from in ACKS? Having an ability score of 18. We can therefore posit that taking a proficiency that gives you a skill at 11+ grants you 4 points, and then treats you as if you have an 18 in the ability related to that skill - 18+ lowered by 7 is 11+. Boiling this back up to the Everyman skill roll, we can allow that roll to be modified by ability modifier, if any - a novice is helped by his natural aptitude. When the character decides to become proficient, any natural aptitude is overridden by the training (you get an 18 for purposes of that skill only), so that the ability score modifier (positive or negative) no longer applies. That's good clean math right there. It's not quite as permissive as the Crypts & Things use of S&W's single saving throw as a general skill resolution system, as you're not progressing by level. And it's a bit high. Allowing situational bonuses (like Tracking does) is also a decent idea, though somewhat objective from the DM's viewpoint. Character background may also be good for a bonus of +2 or +4 if strongly correlated - a thief who grew up with a mummer's troupe, even if they didn't take Disguise, should roll at 14+ (18 - 4 - INT mod, if any), and 18+ if the target is very familiar with the subject. That seat-of-his-pants 14th Cleric might get a +4 if he was orphaned and raised in a monastery, thereby allowing his background to supercede a formal proficiency choice - rolling at a 5+. Taking Theology once would take him down to 3+. That's not too bad. Doesn't even need to be on the character sheet. We can complex that up with the table to the right, which includes the 1/2 level related-to-class bonus. Skills like Contortionism that give a flat 18+ roll, rather than the 11+, can be said to start out at 25+ - effectively impossible if you do not grant any modifiers, whatever their source. That'd fall out being like this next table - things more related to pure ability and experience, and perhaps not something any class would teach you - it'd have to be part of your background. 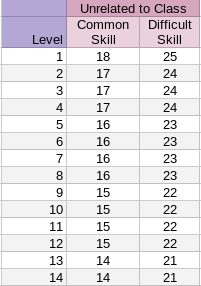 Three others - Acrobatics, Arcane Dabbling, and Loremastery, actually get better with level, but start out around that level - 20+, 18+, and 18+, respectively, though Arcane Dabbling reduces by two per level. Those are also three things that could be strongly considered in the category of "class ability", and have been in other clones and editions of the game. We kind of double up on ability there, but if we're going a step beyond "trained in a skill" to something that's more "class ability", that should gladly incorporate that extra bonus in a game in which PCs are very strongly "classed". 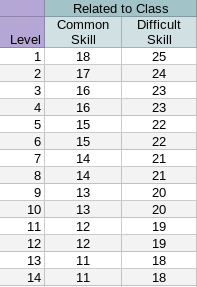 This table more-or-less follows what Crypts & Things does with converting the single save to a skill roll - and is what I'll be following in my project to simplify ACKS up for quick gaming with the kids. In theory, if you'd want to continue to use the ACKS proficiencies for skills like this, a Cleric taking Theology or a Ranger-type taking Tracking, if you deem either of those a class skill, would take a 7 point bonus to these rolls, starting out at 8+ at first level, and hitting 0+ at 8th, which may or may not work for your own sensibilities. I actually started playing in a game a couple weeks back, and we had our first "real" session last weekend. It's Trailblazer, a sort of DND 3.75E that takes a different tack than Pathfinder. It tones things down, as opposed to Pathfinder's "taking it to 11", and simplifies more than a few things. On top of that, we're playing under the E6 rules. We're doing this through Skype and Roll20; one person in the U.S Pacific Time Zone, another in Central, and the last at UTC+1 hours - in Germany. We're shorthanded - this is the old college gaming group, and as I've complained before, we're having hard times carving out the necessary time. This is a good start though - if we keep going I hope to have more buy-in as they see the fun they're missing. Since time is a premium, we're starting off at 6th level, and as E6 runs, we'll be gaining XP to gain feats. Since E6 runs a little on the old-school side, I thought it'd be interesting to show my character as is, then create his mirror-universe ACKS equivalent. I'll do some sporadic notes throughout. I don't remember much about Dark Sun, and only knew a minimum to begin with, so I'll just present a minimal backstory as is without commentary as to what might not be canon. I'm an ex-gladiator (Fighter), released from the pits by Hammanu himself for the prowess and honor I showed in battle, now able to roam Urik as a freeman, and, indeed, train with Hammanu himself in his 'dojo'. I run with a Whisper Gnome (whose tribe lives in the undercity of Urik at Hammanu's discretion) I befriended shortly after freedom, who, as a matter of supporting his people, takes interest in the happenings of the surface city. I, myself, am a proud, free citizen of Urik. BEHOLD! Kan Kaleus, The Scorpion, The Sting of Urik! Name cribbed up from the cadence of the names of the peoples of Barsoom; Dark Sun being a reskinned Burrough's Mars. Yes, these are good scores. This was a high point buy - it is Dark Sun, and, that's how our DM rolls. Numbers are all relative - if I'm dumb, I'll die no matter my scores. Fun fact: My initiative bonus is better in ACKS than in TB-E6. Why? A +2 on a d20 roll is only a 10% bonus, a +2 on a D6 is a 33% bonus. One of the great things Trailblazer does is get rid of the +0/-5/-10/-15 BAB iterative attack progression, in favor of giving just two attacks at level 6 at -2/-2, then -1/-1 and +0/+0 at 11 and 16 respectively. This speeds up combat, and increases your effectiveness, as most of the time the -10/-15 attacks were throwaway anyway. Combat Maneuver/Defense is part of the streamlining of Trip/Disarm/etc., Pathfinder did the same thing. The BAB of +6 converts to an Attack Throw of 5+ in ACKS, conversely, the 7+ converts to BAB +4. ACK's Armor Classes are much more limited than 3.5E, however. The ACKS character would meet the TB character in BAB at level 8. The TB Character is wearing "Light Caravan Armor", +4, from athas.org's Equipment PDF. The build of the character is a quick-on-his-feet piercing weapon expert, and in ACKS we'll be wearing leather, to take Swashbuckling. We'll take Fighting Style: Weapon and Shield, and we'll be able to increase our AC by one when fighting that way. Trailblazer takes AOOs, ends the practice of getting an AOO vs a target for closing in, and adds "Combat Reactions", little things you can do to aid an ally or brace yourself before an incoming attack, that you can do with the same "action pool" as AOOs. I put ACK's Cleave here, as it's the only real equivalent. I'd have to spend two feats (Cleave + Great Cleave) to get that ability in Trailblazer/3.5. The TB character has taken several feats to be able to wield a polearm two-handed and be able to wield and bash with his shield. That's the "Scorpion" part. In ACKS, we don't have that, and I'm not seeing anything at a glance that would prevent me from wielding a spear with one hand and a shield in the other. I've spent 2 feats and a Trailblazer Fighter Expert Proficiency on being able to take a swift action to switch a polearm between 5' and 10' reach, or a free action for a regular spear. In ACKS, there's no real distinction - I can 'attack from the second rank', or in regular melee combat. I'm losing a bit of damage in ACKS as the TB build is allowing me to use both hands on the spear. That's all just because I want to hold 'The Scorpion' as my gladiator nome de plume. The things you do for flavor. There are no multiple attacks in ACKS, so there's no need for an Improved Shield Bash option. Interestingly, this is a clean argument for using the same damage die for all weapons (or per class) - if I'm doing a d6 no matter what I'm swinging, I can poke with my spear or bash with my shield with no change in my roll, just to add flavor or detail to my combat, without adding any mechanics or entries on a character sheet. The mapping for Weapon Focus is obvious, but, Combat Expertise? The two Fighting Style proficiencies are allowing me each round to change from a +1 to hit or a +1 to AC, which in lieu of any special defensive maneuvering added to ACKS, is the only way to emulate that. Dodge and those skills are mostly setup for future feats - I'm going through the Combat Expertise->Whirlwind Attack tree as XP piles up. The ACKS proficiencies don't really match up in effect, but at least capture the flavor. Endurance maps to Endurance. I've taken it as nod to the fact I have to care about extreme heat in Athas. Weapon Specialization is completely subsumed by the Fighter's Damage Bonus progression - you can correctly say that ACKS gives every Fighting 2 class Cleave, Great Cleave, and a progressive Weapon Specialization in all weapons. All in all, it came out pretty well. I could get a more complete mapping by making a custom Gladiator class that would drop one or more armor proficiencies for other powers. So, if you've ever gone back to the beginning of this blog, you'd know I started this to quasi-document introducing my children and the next generation of the folks I game with to D&D. I've not had an actual play report since September of last year, which is the single time we've gotten the children together in the same room to game. As it turns out, kids are really freaking busy. Who knew, right? Fortunately, there's two children whose schedules I fully understand and control. They just turned 8 and 4, respectively. I'm pretty settled as to how I'm going to go about this. But, since I've got this blog, I can trickle out the process on this here interwebatron out-of-band from actually doing the gaming portion. Caves And Claws: This is a cute little boardgame. At it's most basic, there's a configurable board with paths that lead to 'dungeons'. In the dungeons are treasure, or a monster that guards treasure. Each monster has a specific sort of object that takes the monster out of play. The idea is to get as much treasure out of the dungeon as possible. The basic rules are great for learning the game, but if you go in and randomize the layout, you can easily get into a more difficult or impossible-to-win situations. Lego Heroica: By Zack's Goggles, would I have killed for this when I was 10. Essentially, you run little 1x1 Lego Minifigs around a preset dungeon, which from a bird's eye view looks like a dungeon mapped out on graph paper. There's items to pick up, items you can buy, monsters to slay, doors to unlock - the simplicity of the rules make adding on a snap. Out of the box there's rules for a "battle" mode where one person runs the monsters, and gold & item collection is meant to persist between "missions". Since it's Lego, you can rework and combine all the sets to your heart's content. Honestly, it's a better dungeon game than Dungeon!, as far as a gateway to D&D. Different classes, a concept of a referee, freedom to reconfigure the "board", and an amazing capability to support more complex house rules. Get it before it's gone! Lego doesn't make these themed games forever!